HSSC Constable & SI Recruitment 2018 - Apply Online for 7110 Constable & SI Posts in Police Department, Haryana. Online Applications are invited by Haryana Staff Selection Commission (HSSC) from 16 Oct 2018 to 22 Oct 2018 11:59 PM for 7110 vacancies. HSSC Constable Revised Answer Key 2019: Haryana Staff Selection Commission (HSSC) has issued the Answer Key on 11 Apr 2019 for HSSC Constable Revised Exam 2019. Answer Key can be accessed from the link given below. 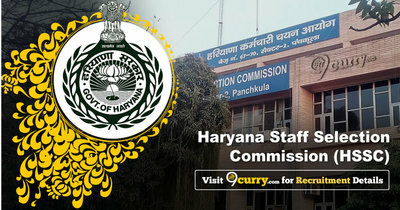 HSSC Constable PST Result 2019: Haryana Staff Selection Commission (HSSC) has announced the Result on 15 Feb 2019 for the exam which was conducted on 14 Feb 2019. HSSC Constable IRB Result 2019: Haryana Staff Selection Commission (HSSC) has announced the Result on 07 Feb 2019 for Constable IRB Exam 2018 . HSSC Sub Inspector SI Result 2019: Haryana Staff Selection Commission (HSSC) has announced the Result on 01 Feb 2019 for HSSC Sub Inspector SI Exam 2018 . (ii) Hindi/ Sanskrit up to Matric standard or higher educations. (i) Graduation or its equivalent. (ii) Hindi/Sanskrit up to Matric standard or higher educations. 5000 (Gen=2300, SC=900, BCA=700, BCB=400, ESM-GEN=350, ESM-SC=100, ESM-BCA=100, ESM-BCB=150) (Re-Advertised) 18-25 years (as on 01.04.2018). 83 Centimeter (un-expanded) on 87 centimeter (expanded). 81 Centimeter (un-expanded) to 85 centimeter (expanded). 168 Centimeter of Eligible reserve Categorie. Eligible candidates may apply online at HSSC's website (direct link is given below) from 16 Oct 2018 to 22 Oct 2018 11:59 PM.